ESA/ESO/NASA/Hubble – Using the best space telescopes on Earth and in Space, scientists have been able to capture a rare photo of galaxies colliding and creating more stars from the massive collision. Space scientists used the Hubble and Spitzer telescopes located in space, the ALMA space telescope located in Chile, the Very Large Array telescope in New Mexico, and the Keck Observatory facility in Hawaii to observe the collision of these distant galaxies and to produce the resulting photo image. Space scientists are so glad and elated that they were able to capture the rare galactic-collision image, and they are even more excited at the possibility of seeing a ring-shaped collision behind the band of collision in what looks so similar to be the Milky Way. The space researchers have been lucky to capture this rare image because the galaxies have actually been aligned the right way, and the positions have given them a vantage point to watch distant galaxies through the one closer to Earth. 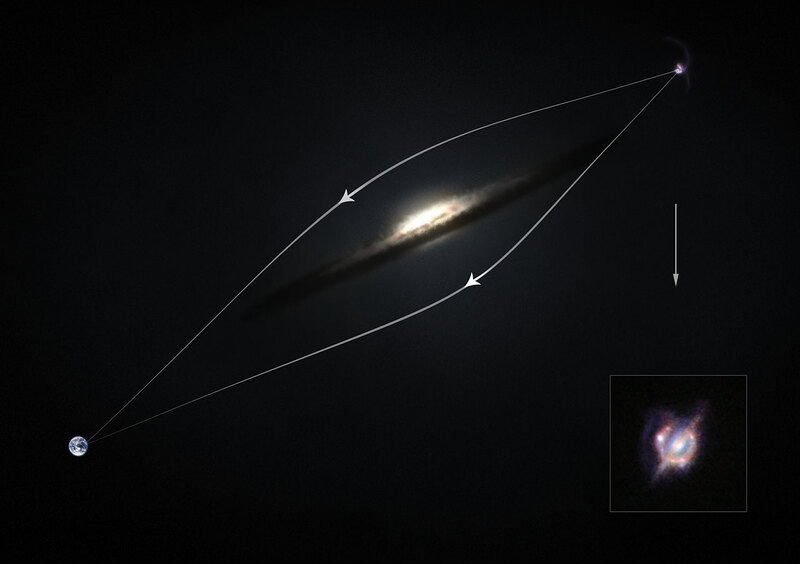 The captured has been called H-ATLAS J142935.3-002836 and the researchers had used a gravitational lensing method to achieve the photographic feat. This space image and the feat behind it would give scientists the ability to watch what is going on in other galaxies and to accurately predict or watch how galaxies interact with one another or even produce stars from the process. These new studies of the galaxy H-ATLAS J142935.3-002836 have shown that this complex and distant object looks surprisingly like the well-known local galaxy collision, the Antennae Galaxies. Credits: ESA.